Tired of making soggy chicken and limp vegetables in the oven? Looking for a way to cool baked goods so that they set right? Imagine hosting a fabulous dinner party where you serve perfectly crisp oven-fried chicken, roasted seasoned veggies and the most delicate pastry delights for dessert – all using just one versatile rack. What Makes Our Rack Different? – NO PLATINGS OR COATINGS – You can put your worries to rest about cheap metal platings that scratch, or worse, non-stick coatings that transfer chemicals and toxins to your food. 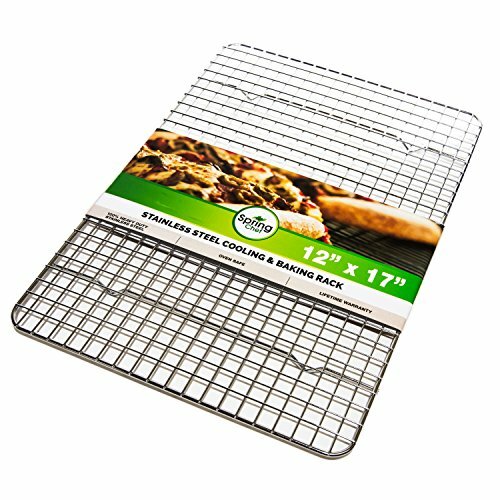 The Spring Chef Stainless Steel Cooling & Baking Rack is made completely of 100% solid Stainless Steel, making it durable and a healthier alternative that will last longer and save you time and money. – ENGINEERED WITH SCIENCE – The rack size, height and grids spacing has been specifically engineered by a team of specialists to ensure the rack allows proper air flow to optimally cook foods and properly cool baked goods. – BEND-PROOF TECHNOLOGY – the rack retains its shape even after heavy food items are placed on it! – LIFETIME WARRANTY AND MONEY BACK GUARANTEE – If you are unsatisfied for any reason, just contact us and we will take good care of you. Get yours now while supplies last and start creating healthy and delicious meals and desserts that look and taste like perfection. Tired of making soggy chicken and limp vegetables in the oven? Looking for a way to cool baked goods so that they set right? Imagine hosting a fabulous dinner party where you serve perfectly crisp oven-fried chicken, roasted seasoned veggies and the most delicate pastry delights for dessert - all using just one versatile rack.